LG just unveiled the world’s biggest billboard, elbowing its way into the Guinness World Records book with a new ad for the flagship G3 in Saudi Arabia. The massive new billboard is as long as two full-sized soccer fields and located at the Riyadh International Airport, which gets about 20 million visitors per year. 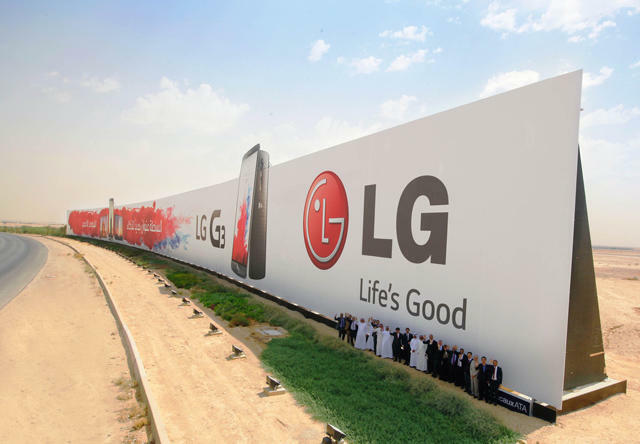 LG’s new billboard is also designed to hold up against strong winds and sand storms thanks to a massive steel supporting structure that weighs 1,800 tons. The G3 itself is a great phone, though we wish LG had used metal in the phone’s design as well instead of opting for that “metallic” plastic. Otherwise it’s an awesome device with high-end specs. Back when the G3 first hit the market it was probably our favorite phone around, but a few months later LG’s flagship has some serious competition. There’s the new Samsung Galaxy Note 4, which offers an even bigger screen at the same awesome 2k resolution, and Motorola’s new Moto X. There’s also the iPhone 6 and iPhone 6 Plus to consider. Maybe this massive billboard will help keep some eyeballs from wandering to competing handsets.